Talking Suitcases™ is an exciting and creative project for teenagers. Participants create Talking Suitcases about the things that matter most to them in their lives; challenges or struggles they have faced, friends and family, dislocation and loss of home or loved ones, objects of passion, or childhood memories. They reflect on what is meaningful to them and hear the stories of their peers. They discover similarities as well as differences in an atmosphere of safety and trust. This project is most successful when combined with a significant writing component. 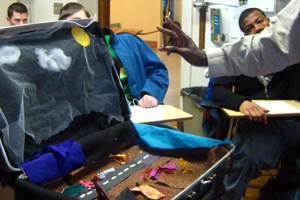 Talking Suitcases™ is a powerful project for ELL students to find their authentic voices in English and share personal stories that are often marginalized in mainstream high school culture. The performance and display of their work can include sharing with non-ELL peers, school staff training, and public forums. Recent Projects: Buffalo High School, Buffalo, MN, in partnership with Intermedia Arts; Work Opportunity Center, Minneapolis, MN, in partnership with Intermedia Arts; Ridgedale Alternative Program, Golden Valley, MN; Southwest High School, Minneapolis, MN; Alternative School, White Bear Lake, MN; and Hmong American Partnership, SLOT Youth Program.